“Active Listening” is often used as a nebulous catch-all phrase for anything related to paying attention to a person speaking and their message. But at its core, Active Listening is a very specific and simple approach that can have a surprisingly transformative impact on most of our verbal interactions: social conversations, sales and business, doctor-patient discussions, negotiations, conflict resolution, coaching and mentoring, etc. Active Listening was initially developed by clinical psychologist Dr. Carl Rogers at the University of Chicago and then extended by his students Richard E. Farson,  and Dr. Thomas Gordon (later a well-respected, licensed clinical psychologist as well). Although the method was developed in the 1940s, the term "Active Listening" wasn't coined until the late 1950s. In a nutshell, the goal of Active Listening is to listen with empathy (aka empathic listening). Active Listening helps us ‘get inside the head’ of the other person - that is, see the discussion topic through their eyes. It helps us adequately understand what someone is trying to share about their opinions and needs. The idea is that, by understanding the other person better, we’re able to respond in an informed and appropriate manner, and avoid costly misunderstandings. Listen to obtain total understanding of the speaker's message. Feed back to the speaker what you think they've said. Let’s look at each step. Listening with empathy requires us to withhold judgement. To do this we must choose to keep an open-mind and just listen. We temporarily suspend our opinions and feelings about the topic in order to truly hear what the speaker is saying. Also, we let go of our preconceived ideas of what they believe and feel about the topic. I know that this is hard. Everything in us wants to defend our position to the bitter end! But doing this causes you and I to interpret and skew everything that we hear through our own frame of reference. We end up listening to our own ideas and not to those of the speaker. However, listening without judgement does not mean needing to agree with them. It only means keeping an open-mind long enough to adequately understand the other person’s perspective. And if you do disagree with something being said, after you’ve listened to the point where you can empathise with them (i.e. see the topic through their frame of reference), then go ahead and tactfully share why you disagree. key information in the literal content (i.e. verbal cues). Look for repeated words and phrases, common themes, assumed background knowledge, highly specific statements or requests, omitted information. non-verbal cues that hint at underlying feelings and attitudes. Feelings are expressed via gestures, facial expressions (e.g. serious or light-hearted), abnormal silence, posture (such as relaxed or leaning forward), tone of voice, volume (calm, nervous, raised, etc), rate of speech, emotions, and others. This verbal and non-verbal information will give you a more complete understanding of the speaker’s message. This step is often included in Step 2. But I like to break it out for clarity. A key action when listening for total understanding is staying quiet - just listening attentively - without interrupting your conversation partner so that they have freedom to talk. But at times we need to break that silence in order to ask questions. Don’t be afraid to ask questions that clarify your understanding or encourage the speaker to elaborate further. Typically, you’ll cycle between listening (Step 2) and asking questions (Step 3) until you sufficiently understand their message from their perspective. Then you can move onto Step 4. Ask questions that keep the conversation focused on the speaker and their topic (read more about support responses here). Avoid shifting the focus of the conversation onto yourself. Over-thinking your responses will paralyse you or make you come across as formulaic. I like to keep it simple. Just relax and ask questions about the verbal and non-verbal cues that capture your attention. I find that this helps make the Active Listening process flow more naturally and conversationally. Here are some Active Listening questions that I find useful. "How did you come to that opinion/conclusion?" Take note of any non-verbal cues that seem relevant to the discussion. Verbally describe what you're seeing to the speaker when they pause. Follow up with a clarifying question or statement. In the above video, Amy clarifies Sheldon's comments, encourages him to elaborate and reflects his feelings (albeit somewhat sarcastically). 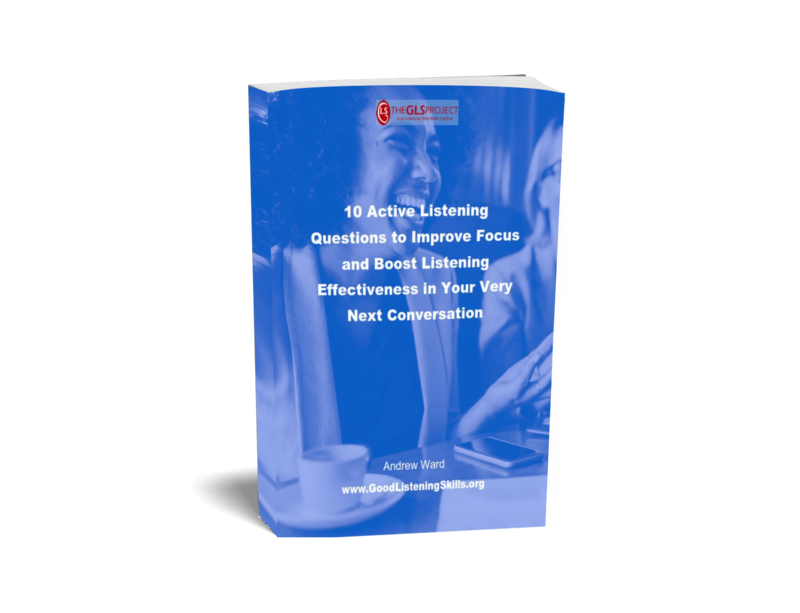 And as a kick-start, you’ll get a cheat-sheet of 6 bonus Active Listening questions (plus examples) to boost your conversations even more. Enter your email to receive easy, weekly listening tips that actually work, as well as other free training tips and downloads. From time to time I'll launch paid products for subscribers wanting to go further, but will never spam you - I hate it with a passion! Assume upfront that you will misunderstand the speaker. Even if you hear perfectly, you may interpret their message from your viewpoint rather than theirs. Also, feelings are notoriously difficult to interpret because our past experiences, cognitive biases and filters skew the way we interpret information. So, make a habit of regularly confirming your understanding of what you’re hearing (the literal content) and observing (the non-verbal cues). When the speaker says that I haven’t correctly understood them, I find that they usually offer the correct understanding. But when they don’t, I jump back into steps 2 and 3 in order to seek further clarification and elaboration. Now that you adequately understand the speaker’s message from their perspective the active listening process ends and it’s time to utilise your understanding in the ongoing dialogue. Ask more questions to further develop the discussion. In social conversations it’s important to balance listening with talking in order to come across as an interesting person. So, offer your opinion on the discussion topic, then stop talking in order to see how your conversation partner(s) responds. In mentoring, you could utilise your understanding to ask highly specific questions that more effectively guide the speaker along their journey of self-discovery. In business and sales, this Active Listening process will have helped you better understand the customer’s needs. So you could now offer them some options specifically tailored to meet those needs that they've told you about. Although this example relates to engineering, Active Listening can be used anytime you need to gather stakeholder or client requirements, or just want to figure out what your loved one actually needs. Client: We need to understand the impact of this generator on the local power system. Client: Circuit loadings, voltage drop and fault currents. Client: A number of setbacks have delayed the project. Client: Yes. Is this possible? At the start when you’re trying to come up to speed with what the speaker is telling you. Throughout the discussion to clarify any vague or ambiguous comments. When closing out the discussion, confirming that everyone participating in the discussion have the same understanding of what’s been discussed, and summing up any key conclusions and actions. I believe that Active Listening is the key skill to getting the most from our discussions. Persist with using it until each step becomes second nature to you. It'll take some conscious effort to listen actively until the process becomes habitual. But that effort will pay off with much greater depth of understanding of what people share with you - that is, much fewer frustrating misunderstandings! Which step will you start practising this week? Tell us in the comments below. And remember to sign-up for weekly listening tips and get your 6 bonus Active Listening questions (click here). Rogers, C., Farson, R. E., "Active Listening", Gordon Training Inc., www.gordontraining.com/free-workplace-articles/active-listening/, Extract from 1957 article. Gordon, Thomas, Ph. D, "Origins of the Gordon Model", Gordon Training Inc., www.gordontraining.com/thomas-gordon/origins-of-the-gordon-model/, Referenced Jan. 2019. Hello, I’m Andrew Ward and the Kiwi guy writing most of the stuff on this website. You can read more about my story here.